Faye is teething and we’re all suffering. The poor thing is exhausted, but can’t sleep. Hungry, but can’t eat. All she wants is to be held and to chew on cold items. Forget trying to put her down after she’s finally drifted to sleep; your arms are her new mattress. Dealing with teething means that meals happened about 3 hours after the moment we realized we are starving. Tonight, it also meant that I would have to make do with what was in our cabinets and fridge for dinner. This is where this old favorite standby of mine usually pops into the forefront of my mind. With a few staple pantry ingredients and 15 minutes, we had dinner–a cheesy, delicious, easy to eat with one hand while-trying-to-calm-a-fussy-baby-with-the-other dinner–and enough leftovers for tomorrow. 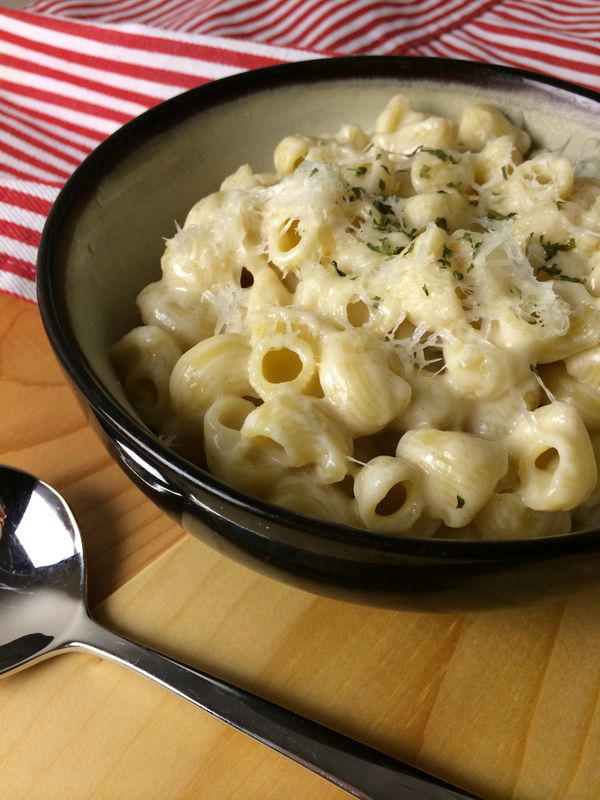 NOTE: Most people make alfredo with parmesan. I make it with Locatelli Pecorino Romano as I really don’t like parmesan. So, can you use parmesan instead of the pecorino? Eh. You could, but I don’t think it will be nearly as good as the Locatelli. 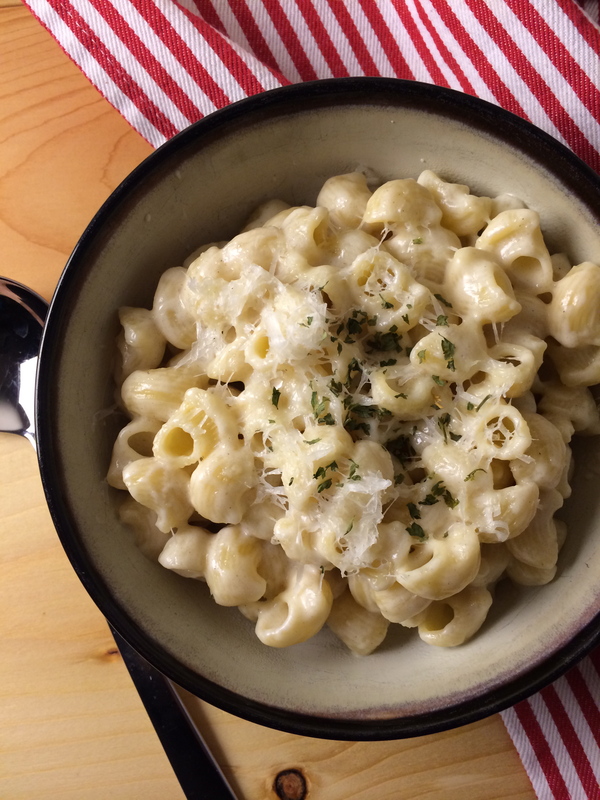 I urge you to switch out your parmesan for Locatelli Pecorino Romano for good. Your mouth will thank you. Melt butter over low heat in a medium saucier (or pot, but a saucier has a rounded bottom, making whisking easier). Whisk in flour. While whisking, add in milk a little bit at a time (like a Tbsp) as to prevent lumps. Make sure mixture is smooth each time before you add the next bit of milk. After you’ve added in about ½ a cup of milk, you can quickly add the remaining milk and heavy cream, but still whisk it smooth. Raise heat to medium and let the milk heat up for 3 minutes. Whisk every minute, making sure to scrape the bottom of the pan. While you are waiting for the milk to heat up, microplane your cheese. If you don’t have a microplaner, use the smallest hole on your cheese grater. This is a hard cheese and you need it as tiny as possible to melt properly. Grating pieces that are too large will result in a gritty texture. Check your water. As soon as your water boils, add salt. I use 2 tbsp of salt for about 4 quarts of water. Taste the water after adding your salt. It should be salty, but not overwhelmingly so. Bring water back to a boil. Add in your pasta, stir every 2 minutes, and cook according to the directions on the box until al dente. Whisk in ½ tsp white pepper. Decrease heat to low. Continue whisking occasionally while you wait for the pasta to finish cooking. When the pasta is al dente, drain the water off in a colander. Pour pasta back into the pot. Add the cheese sauce and stir with a wooden spoon. Serve in bowls and garnish with a bit of Locatelli and parsley (if you have it).